The expression “dress for the weather” takes on a new meaning when one is running a half marathon in temperatures hovering around -30 C.
The expression "dress for the weather" takes on a new meaning when one is running a half marathon in temperatures hovering around -30 C.
Nearly 200 people joined the Hypothermic Half Marathon on Sunday in Edmonton. The main 21-kilometre run started at 8 a.m. but participants had the option to do a 10-kilometre run at 9 a.m. or 5-kilometre run at 10 a.m.
Kim Black, area manager of the Running Room in Edmonton, first did the run 10 years ago. She said there's satisfaction at the finish line. "First off, it's bragging rights," Black told CBC News on Sunday. "You feel definitely relieved, you feel proud that you completed it. Yeah, hard work." Hugo de Rosnay, from South Africa, completed the 21-kilometre half marathon. "There's a new definition of cold in my world," he said. "It was still enjoyable." He said as a runner, one must get accustomed to the weather. De Rosnay wore three or four base layers, wool socks and long pants. The runners get hand warmers and other swag in the Hypothermic kit. "If you just keep moving, it's not too bad. It's when you stop, then you feel it." 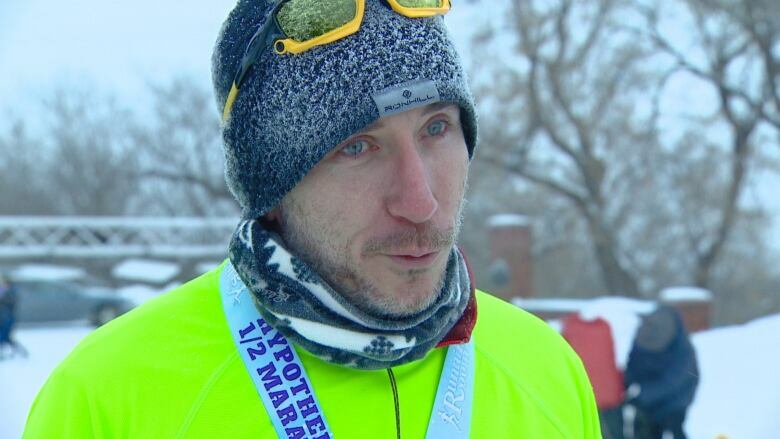 Whether in first or last place, De Rosnay said the runners support each other and make sure everyone is safe. The event wrapped up with brunch at the Highlands Golf Club where participants get a chance to thaw out and swap stories.